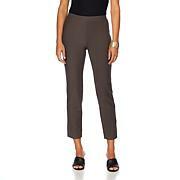 I love these Premium Knit Trousers. I tried the Fit & Flatter, but like this fabric much better. I'm 5'6" and they are a bit long. I am wearing them with heels, but will probably have them shortened an inch. They fit close to the body (1X) and hide any lumps or bumps. Very flattering. I bought all the colors in these pants. The best fit I have gotten in years. They wash well and don't loose their shape. My sister recommended these pants, so I bought them in black. They fit perfectly and are perfect for the office or any occasion. Even though I have to hem them up a couple of inches, that will not stop me from buying them again in other colors. Thanks, Marla! My new favorite pants to wear on business. Great fabric, style/cut and comfort galore! Thank you, Marla!